t*rexes and tiaras: Top 10: Orla Kiely..
My 2018 spending ban is going well so far, but it hasn't stopped me from window-shopping to excess. 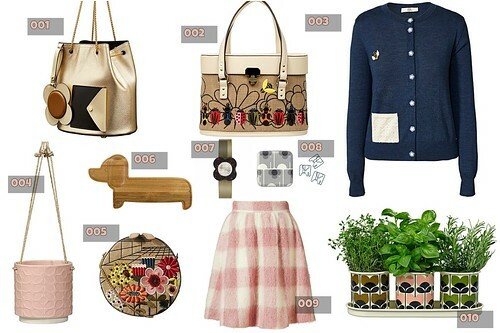 I stumbled upon the Orla Kiely website for the first time in absolutely ages, and fell for all of the above. In particular, the preppy checks of this baby pink skirt and all of the bugs which seem to be adorning most of the SS18 collection. That embroidered bugs bag is amazing (002). I do really like the triple herb pots! That skirt is cute and reminds me of that Matalan one you had that was longer with a sheer panel! Ooh, I must dig that out!